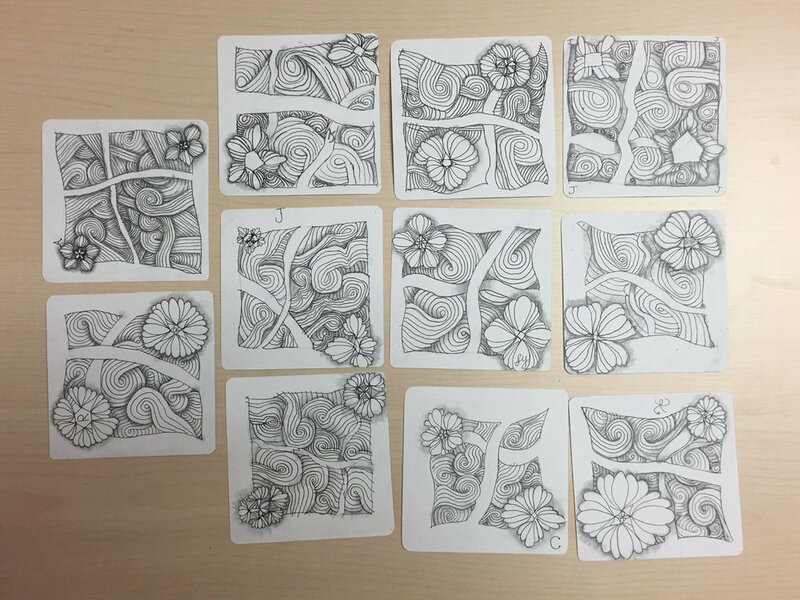 We offer Zentangle classes to corporations looking to offer a unique, fun, and relaxing activity to their clients or employees. 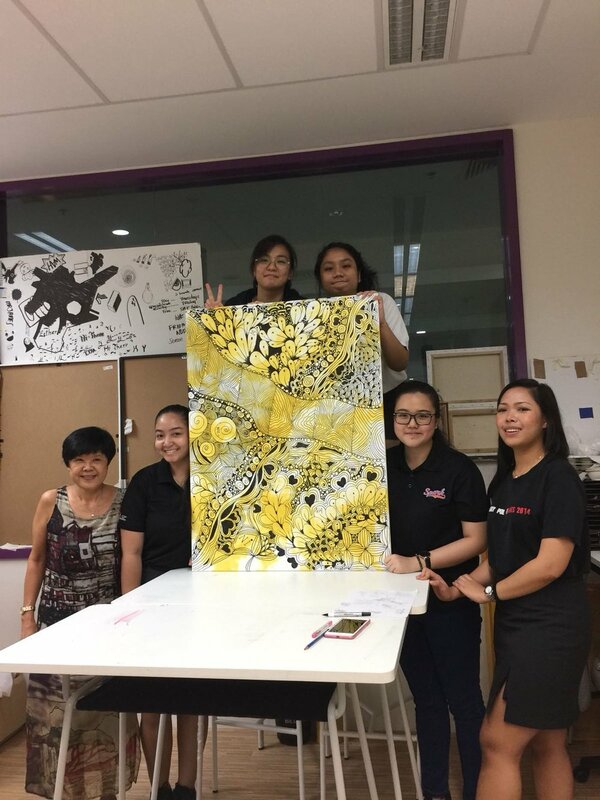 We have worked with organisations such as the Ministry of Education, Grand Hyatt Singapore, Shangri-La Hotel, HDB Hub, Singapore Cancer Society, Ngee Ann Polytechnic, Singapore Polytechnic, Alexandra Health, and SingEx (Expo) to bring interesting Zentangle programs to more people. Each participant will have one small canvas to work on. These small canvases will then be pieced together to create one large art work, to show that they are one small part of a bigger picture and that their uniqueness is what creates something amazing. small canvases for each participant (good if you want participants to bring home their art works). Participants will get to learn some Zentangle patterns, and then be guided through how to piece those patterns together to create a beautiful design. Their creations will be made on a cotton tote bag, using fabric markers. Participants will get to bring home their tote bag and the fabric markers. This is a fun and relaxing class that results in a wonderful and usable product to bring home as a keepsake. In this class, participants will learn a few Zentangle patterns. They will then be given templates of animals/flowers/sceneries to fill in with those patterns. At the end of the class, each participant would have completed their very own colouring page that they can bring home to colour. This is a class that will push participants' creativity. If your organisation wishes to do so, the final pages can also be compiled and printed into an actual colouring book. This is a one-off class that teaches participants the eight steps to the Zentangle method. Participants will get to learn how to create their own Zentangle art from start to finish. Participants will get to bring home their own Zentangle art work that they complete during the class. Some companies allow us to teach weekly classes in their premises. Each term lasts one month- with four classes (one class every week). Each class lasts one hour and thirty minutes. "Joni and Stephanie are very professional in their dealing with the art. They taught me how to draw with an open-mind and not be critical about what I do. The main purpose is to really enjoy and relax in the process of tangling. Indeed, I find it very rejuvenating and it releases my tension from work. My peers, who had also gone through the classes with them, were also amazed that they can draw! To highlight: some of them had never drawn anything before. The whole session was well-organised and executed in an interesting and fun way. I would highly recommend this as a team building activity. The Zentangle workshop teaches one to appreciate art and also to explore the simplicity of life. At the same time, it really help to relax and clear ones’ mind as the workshop had promised. In fact, after the session, a few of my friends actually invested in colour markers and canvas to draw Zentangle art during their free time! Thank you Teacher Joni and Stephanie!" This is how we will contact you. Please make sure spellings are correct. You can select one, or more options. Your enquiry has been sent. We'll be in touch with you as soon as we can. Thank you and have a great day ahead of you.